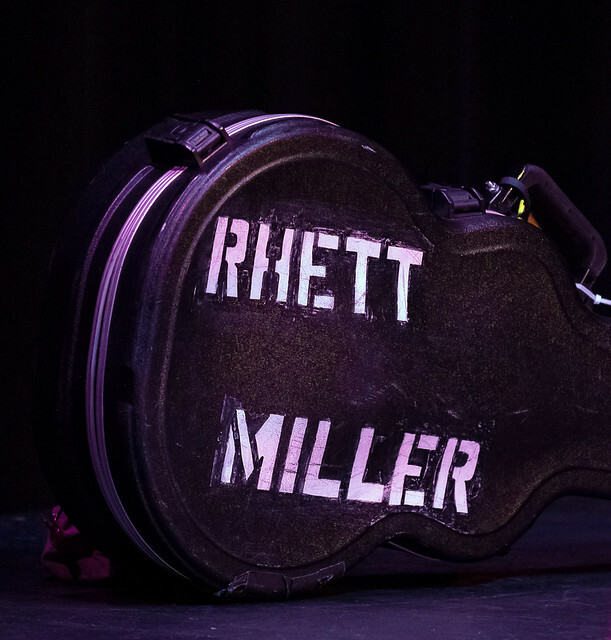 Rhett Miller Shakes Up The Stage Door Theater Reviewed by Kris Engelhart on April 10, 2019 . 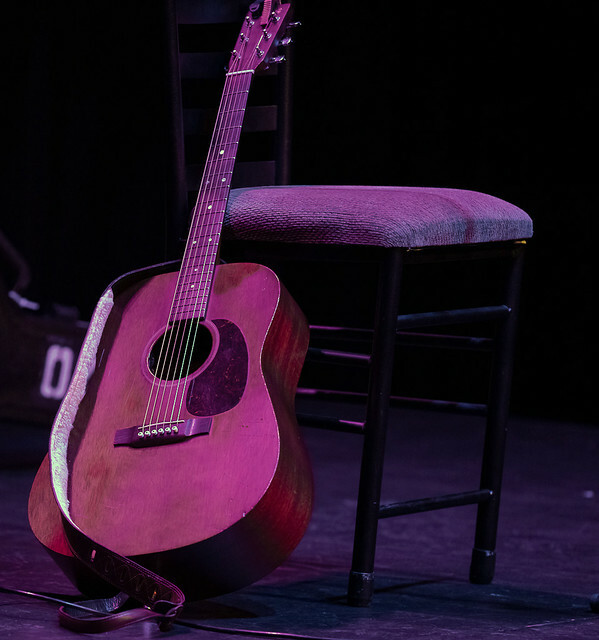 When most people think of an acoustic tour, they picture a laid back show, more intimate, and perhaps even a little on the boring side. After all, it’s usually just one guy and a guitar right? Personally, I love the pureness of an acoustic show. It’s a chance to see your favorite artist stripped down, raw,and experience their music in an entirely new way. 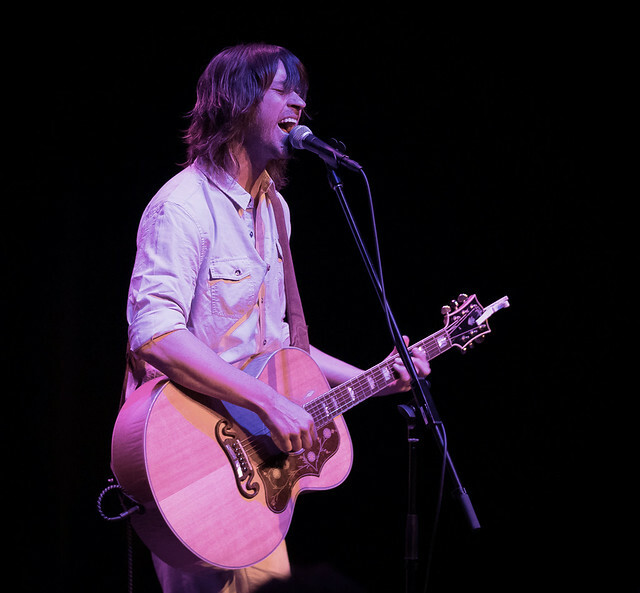 So it goes without saying that I was pretty pumped to be heading to the Stage Door Theater Sunday evening to see Rhett Miller perform as he made a stop in the Queen city on his solo acoustic tour. The Stage Door Theater is a unique venue, operating as a true black box theater and is part of the larger Blumenthal Performing Arts Center. The entrance to the theater is actually the stage door for the larger Belk Theater and is where the company and local crew would normally enter It can be a little confusing if you’ve never been there, but if you see the double glass doors on College Street, you have found it. Upon entering, there is a short set of stairs that lead down to the box office with a full bar and restrooms in the lobby area. The show was general admission seating, so upon arrival ticket holders could choose to sit anywhere in the theater and really there isn’t a bad seat in the house. The stage is low to the ground and was set up with two microphones and one seat. 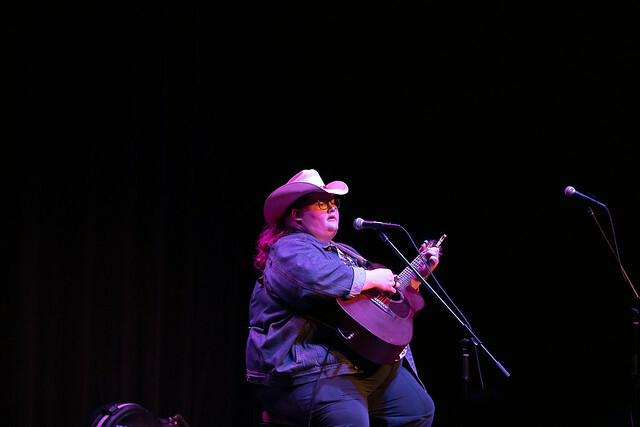 Opening up the show was singer-songwriter Joshua Ray Walker who was personally introduced by Rhett. Miller had nothing but accolades for Walker and told the audience that he was going to do amazing things and that someday they would be able to say they saw him way back when. From the very first notes of Walker’s first song, it was easy to see why Miller held the upcoming artist in such high regard. His voice was pure and resonated across the theater accompanied only by the melodies coming from his acoustic-electric guitar. Walker’s sound was passionate and full of emotion, a hybrid of country and mountain folk. Although, he barely spoke, his set was a lesson in true storytelling as his songs could be felt deeply and earnestly by those in attendance. At one point, he asked if we wanted to hear something happy or sad before telling us all the songs were sad but he would play a fast sad one for us. This was one of those rare moments that you simply knew you were witnessing something special and I am thankful to Rhett for giving us the opportunity to hear such an amazing talent. Walker’s time was over too soon but I know that we will all be hearing a lot more from Joshua Ray Walker in the future. 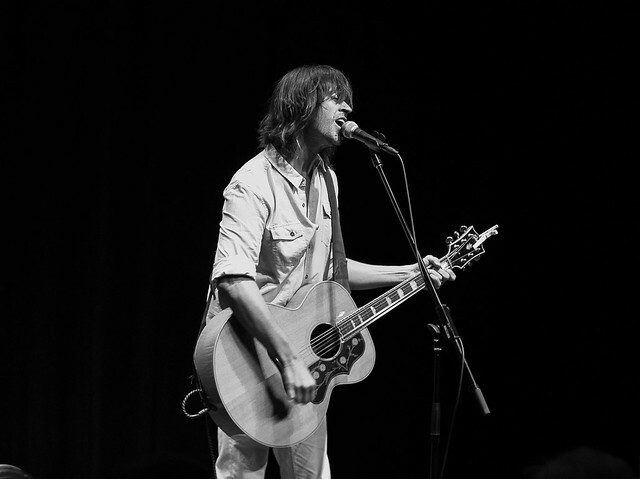 After a fifteen minute intermission, the stage held only one lone microphone and a hard plastic guitar case emblazoned with Rhett Miller and Old 97’s. It was finally time for the main event Rhett came out and thanked everyone for coming before launching into his first song. This is where any preconceived notions of what an acoustic show would be like flew out the window. Miller rocked the Stage Door Theater and rocked it hard, even joking with the fans that he knew it was a Sunday evening and we were all sitting in comfortable chairs, but he was going to wake us up and indeed he did. As an example, he talked about how phones used to represent distance and now they are the ultimate in connection but often at the cost of real relationships and interactions around us. Touching on the focus of the treatment of women that has been in the news in recent years, he jokingly explained that he was all about respect and that the seventeen year old protagonist in the song had a much different feel when he wrote the song at twenty-one. Miller’s vocals have never sounded better and his guitar skills are second to none although his musical chops are not what sets him apart from the rest of the crowd. What I witnessed on Sunday evening was the joy that Rhett got from performing and that special connection between an artist doing what he loves and the audience that loves what he is doing. That is something that can’t be taught but simply is and Miller has it in droves. 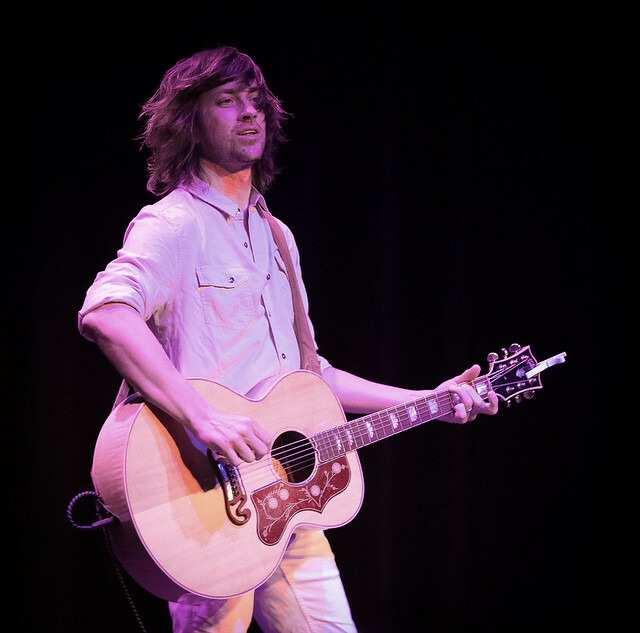 His set included fan favorites from both his solo career and the Old 97’s. Miller commented about how beautiful North Carolina was and how he thought he could live here and be happy which of course was appreciated by the audience. He even told a tale, which he later admitted may or may not be true, about how Frank Sinatra did a gig in Richmond, Virginia and had what he thought was a heart attack on stage. Sinatra apparently ran to his car and told his driver to get him out of there because he didn’t want to die in this town. The story was of course a prelude to the tune “I Don’t Wanna Die In This Town.” Another cool thing that Miller did was ask if there were any songs that people wanted to hear that he didn’t play and when someone yelled out “Stoned,” he happily obliged. What an amazing night of music from both Miller and Walker. If you’re a fan of any kind of music, this is definitely a show that you will want to check out and experience for yourself. You can check out his website below for information on upcoming performances.